Seems like Dreamworks is on a roll with releasing these Alvin and the Chipmunks cartoons. 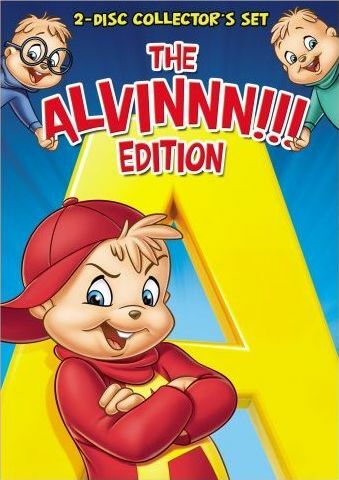 I just finished watching this 2-disc collector's set entitled The Alvinnn!!! Edition , and while I still don't think The Chipmunks are a great cartoon series, I have to admit that it has grown on me a bit. Still, this is a show for children, young children, so there aren't any complex story arcs, in-depth character development, or thought-provoking scenarios. Kids may like the high-pitched voices and the wacky situations, but for me there isn't much to laugh at or get into, which makes it great to have on playing in the background while I'm working on the computer. This set contains a total of fourteen episodes, seven on the first disc and seven on the second. The DVD case is the standard size of a single disc case, but with a slot on either side to hold each of the two discs. Just like the Alvin and the Chipmunks Go to the Movies - Daytona Jones and the Pearl of Wisdom release, there are no extra features and inside the DVD case there is a slip of paper that says "Get on the A List" followed by the URL chipmunks.com on one side and just blank white on the other side. But since this is primarily for young children, I guess you don't really need much more. And with fourteen full episodes, I think this set is a much better deal than Alvin and the Chipmunks Go to the Movies - Daytona Jones and the Pearl of Wisdom, which contained only three episodes. The first episode on the disc is The Curse of Lontiki , where Alvin and the gang are currently in Hawaii. Some TV producer spots Alvin's surfing and offer him a job, which Alivin happily accepts, but then after finding some artifact Simon looks it up in his book and tells Alivin he's cursed. Of course he's not actually cursed, but they all believe it, and accidents continue to reinforce this belief. How many times have we seen this plot in various sitcoms throughout the ages? I will now skip ahead a few episodes to the one entitled New Improved Simon . This also uses a common plot thread found in many-a-sitcoms, but provides an important moral... be true to yourself. Do not try to make yourself into someone your not just to impress somebody, which is exactly what Simon attempts in order to impress a girl that he has a crush on. And of course, every new persona he tries backfires in someway, until he finally gives up and shows his true self. Since this is primarily an anime website, I have to mention the Maids In Japan episode. This one focuses not on anime, but on traditional Japanese Kubuki theater. Alvin in the gang decide to check out a performance, and are enchanted by what they see. Wanting to work some Kabuki into their own act, they head to the theater to sign up for lessons, but since the contract they sign is in Japanese, the unknowingly sign themselves up to perform in the Kabuki theater, not for taking lessons. Of course, when they find out, they have to find a way to hide this from Dave, which becomes difficult when he seems them perform on stage! The first episode found on the second disc is entitled Every Chipmunk Tells a Story , which has Dave coming home to find a complete mess in the house... something dealing with a broken piano filled with oatmeal. What I liked about this episode is how it shows the different perspectives of each of the boys. One by one he has Theodore, Simon, and Alvin come tell him what had happened, and each gives him a slightly different story. It's not that they were each lying, but that they all saw the events happen differently, which happens all the time in real life, and is a great lesson for both kids and adults who don't quite understand this concept. Feeling like the training is just to hard, Alvin, Simon, and Theodore decided to quit, to give up rather than tough it out, and escape from boot camp. They find themselves in one of these new jeeps, which then takes off and heads to the enemy's military base, which is apparently only a few miles from out military base. Once there, Alvin accidentally gives all the proper responses to the guard, who them gives him some secret documents or photographs or something that were stolen from our military base, and the jeep then automatically heads home, and raises it's armor when it comes under attack from an enemy laundry truck... or something like that. Anyway, I think the moral of the story was, if something is too hard, just quit, steal something, get lucky, and get called a hero. Yeah, I skipped over a bunch of episodes here, but really they're all pretty similar. Take some super-simple story, mix in some lame jokes, through in a montage to the tune of some 80s song but sung by the Chipmunks, and wah-lah, you've got an episode that I'm sure kids will find enjoyable, but anyone past puberty will probably not give a second glance. Alvin and The Chipmunks: The Alvinnn!!! Edition , released by Dreamworks, is available starting September 16, 2008.